The season for Christmas romances has begun, and Avon’s anthology of reissued novellas by a quartet of genre stars is one that will delight readers who prefer their Christmas tales with a historical setting. Lisa Kleypas’s Rita-winning I Will, first published in 2001 in the anthology Wish List, leads off. The Earl of Rochester is dying, and he has threatened to leave his unentailed fortune away from his only legitimate son, Andrew, Lord Drake, unless the young man reforms his dissolute lifestyle. Andrew, who has used that lifestyle as a weapon against his father, is forced to conceive a plan that will convince the old earl that his heir has traded riotous living for respectability and responsibility. He needs the cooperation of Miss Caroline Hargreaves, a model of rectitude, to complete his plan. Andrew promises to pay Caroline’s younger brother’s gambling debts and to free him from Andrew’s ruinous influence if she agrees to a fake courtship. Hostility yields to attraction and then love as the two spend time together. Predictable? Perhaps, but it is a joyous read nonetheless. A bluestocking heroine who saves the hero and a hero who is redeemed make this a cherished favorite for me. This novella is part of Kleypas’s Capital Theatre series, and fans of that series will be pleased to see that Andrew’s illegitimate half-brother, Logan Scott and his wife Madeline (Because You’re Mine) make an appearance. This one is an unqualified five-star read for me. Romance Dish regulars know that I love a good reunited lovers tale, and Lorraine Heath gives that trope an interesting twist in Deck the Halls with Love, a 2012 novella with strong links to Lord of Temptation, the second novel in Heath’s Lost Lords of Pembrook series. In that book, Alistair Wakefield, the Marquess of Chetwyn, frees his almost-bride Lady Anne Hayworth to marry her true love, Lord Tristan Easton. In the novella, Chetwyn is fighting for a second chance with Lady Meredith Hargreaves, the woman he loved before and after his betrothal to Lady Anne. But Lady Meredith’s marriage to another is to take place the day after Christmas, and Chetwyn must do the seemingly impossible—persuade Lady Meredith, who was heartbroken when he abruptly ended their promising courtship to enter a duty-bound relationship, to stop her wedding and trust her heart to him. A snowstorm provides the opportunity for a double Christmas miracle—the unlikable Chetwyn of Lord of Temptation proves his nobility and true love wins the day when Meredith exercises her gift of choice. Heath is among the best in the genre when she hits the mark, and she hits it unerringly here. I especially love all the “gifts” that add deeper meaning to this Christmas romance. I give this one 4.5 stars. Megan Frampton’s No Groom at the Inn, part of her Dukes Behaving Badly series despite the absence of dukes, is an entertaining read with enough heart to save it from mere cleverness. Lady Sophronia Bettesford, only child of the Earl of Lunsford, was left impoverished by the death of her loving but improvident father. All she has to look forward to is a future as an unpaid servant in a cousin’s home where she will be in charge of six children and twenty-seven chickens. Mr. James Archer is a young man possessed of a fortune and in need of a faux fiancée. Committed to a life of travel, adventure, and beautiful women whose place in his life is strictly temporary, James panics when he learns of his mother’s plans for him at a holiday house party filled with marriageable maidens. He tells his mother he is deeply in love and engaged. He offers Sophronia a cottage where she and her devoted maid can live free of obnoxious relatives if she agrees to be his make-believe fiancée. What follows is a story filled with fun, lots of clever wordplay, and Frampton’s trademark humor. Sophronia is a dear, and James, although sometimes arrogant, can be forgiven much because he loves his mother and appreciates Sophronia even before he falls in love with her. The novella, originally published in 2015, didn’t quite reach the level of the novels in this series, but it was sweet and amusing. I award it four stars and five smiles. I loved the chapter prefaces! Vivienne Lorret’s The Duke’s Christmas Wish, which first appeared in the 2015 anthology All I Want for Christmas Is a Duke, is the only one of the four novellas that I had never read. It was also my first encounter with this author, so I am not sure how it fits into her Season’s Original series, although publication info tells me that it does. It is another Christmas house party story. In this case, the house party is hosted by Northcliff Bromley, Duke of Vale, who is using it to prove the soundness of his Marriage Formula, a logical system based on the premise that money, bloodlines, and common interests are the best grounds for a successful marriage. Miss Ivy Sutherland, whom the duke notes is of “no consequence” since she is merely the daughter of a country gentleman and possessed of none of the required assets, nevertheless challenges the duke’s assumptions because he cannot ignore her intelligence, her impulsivity (a marked contrast to his careful thought), or her ability to entrench herself in his mind. This story has an abundance of charm, and I liked it enough to add other books in the series to my wish list. It is another four-star read. A Christmas to Remember is a rare anthology without a weak story in the bunch. I highly recommend it for historical romance readers who may have missed the novellas the first time. If you are a rereader like me, you will still find this a winning Christmas read. I think I’ve read Kleypas’s I Will every Christmas since it was first released, and I find it enchanting every time. This sounds really good - thanks! I love holiday stories, and these authors. It sounds like a winner... on my list now! Thanks for the review, I love Christmas romances! Kleypas and Heath are two of my favorites but haven’t read the other two. I’ll have to check this one out. 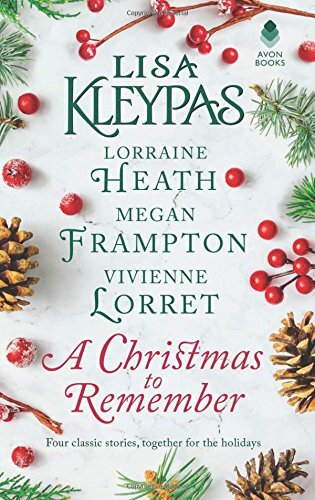 I am such a sucker for the Christmas anthologies....this one sounds like a good one. Thanks for the review. Talented authors generally make for good reading. This sounds like the perfect holiday read. Thanks so much. Thanks for the review, Janga! I love anthologies, especially over the holidays when I'm so busy. Some of my favorite authors were first discovered through a novella in an anthology. Love the review, they all sound wonderful. I love anthologies and always add one or two to my collection each Christmas. This one sounds perfect. Anthologies are perfect for the holiday season when we are often too busy to invest the time it takes to concentrate on a full length book. Thank you for the review.